↑ Roth, G; Dicke, U (2005). "Evolution of the brain and Intelligence". Trends in Cognitive Sciences. 9 (5): 250–257. PMID 15866152. doi:10.1016/j.tics.2005.03.005. ↑ Marino, Lori (2004). "Cetacean Brain Evolution: Multiplication Generates Complexity" (PDF). International Society for Comparative Psychology (17): 1–16. Retrieved 2010-08-29. ↑ Shoshani, J; Kupsky, WJ; Marchant, GH (2006). 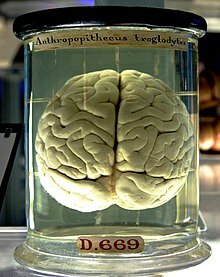 "Elephant brain Part I: Gross morphology, functions, comparative anatomy, and evolution". Brain Research Bulletin. 70 (2): 124–157. PMID 16782503. doi:10.1016/j.brainresbull.2006.03.016.